Welcome to the switchBoard official Blog! SwitchBoard is an In Innovative Training Network (ITN) funded by the European Commission's Horizon 2020 programme under the Marie Curie Actions. The duration of the project is 48 months, starting on November 01, 2015. The switchBoard consortium brings together eleven beneficiaries from eight different countries, combining the expertise of seven academic partners with excellent research and teaching records, one non-profit research organisation, and three fully integrated private sector partners. This European Training Network (ETN) is supported by six Partner Organisations as well as a management team experienced in multi-site training activities and counselled by a scientifically accomplished advisory board. Taken together, the switchBoard training network provides an international, interdisciplinary platform to educate young scientists at the interface of neurobiology, information processing and neurotechnology. Human beings naturally build systems and rules around everything they know and the more they know about these things, the more violations they tend to find in the rules. However, according to a legal principle of republican Rome: exceptio probat regulam in casibus non exceptis ("the exception confirms the rule in cases not excepted"). 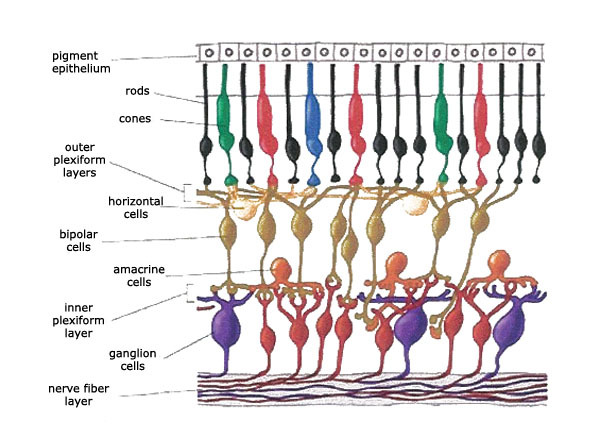 Would you think that we still don't know all the cell types of the retina? Well you should have learnt in secondary school that there are two types of light sensitive cells, called photoreceptors in the retina: the rods and the cones. And then you may still remember that we also have bipolar cells, who connect the photoreceptors to the so called ganglion cells, who then send their long-long axons, which form the optic nerve, to the brain's visual areas, where all the colours and shapes you perceive with your eyes actually become our impression of the world. But those who have learnt about the eye and vision at the university know that things aren't so easy. 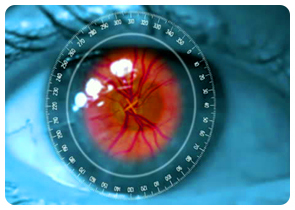 Scientists still add new cell types to our list of "known cells of the retina". Well let's put a little more emphasise on the bipolar cells at this point, because they are excellent examples on what I would like to show you here. One may think that since we have two types of photoreceptors, we should have two types of bipolar cells as well. That's right: this is exactly how scientists classified these cells at first: rod and cone bipolar cells. These names were meant to tell us a lot about their connectivity – their connections with rods and cones. Around 2008, researchers thought that they finally identified all the bipolar cell types of the mouse retina. Wait a second, who cares about mice?! Well I have to tell you, that mouse retina is extremely important in research since the majority of the scientists use mouse retina to study similarities with the human tissue. So in 2008 it was believed that there are 10 different types of bipolar cells: 9 types of cone bipolar cells and only 1 type of rod bipolar cell. As years passed scientists learnt that there still are variations in these 10 types of cells, so they started to create subtypes like type 3a, 3b and so on. At present they think that there are 14 different types of bipolar cells in the mouse retina, out of which only ONE type is a rod bipolar cell, all the rest belongs to the cone bipolar cell "family" (for review, see Euler et al., 2014). Although, that's still not all. The classification turned out to be imperfect since some cells break the rules! Cone bipolar cells, which were believed to contact cones exclusively, were found to have connections with rods (Behrens et al., 2016). Also, surprisingly, the only type of rod bipolar cell also turned out to have connections with some cones. Why is that? Well that's a question many scientists ask themselves worldwide. But trust me, science is evolving quickly, answers are coming soon! For more information on the switchBoard project visit this site. Have fun, love science! Good luck for everybody in SwitchBoard.